John Nguyen (Le) has all sorts of problems. After serving his country in Iraq, he comes home to L.A. and has to deal with not just his PTSD, but also his lazy, none-too-bright roommate (not sure of his name, but he could possibly be in the next casting for Jersey Shore, if his acting was better). 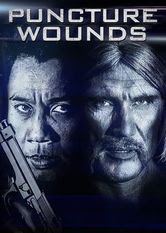 One night Nguyen unleashes his Martial Arts skill on some toughs harassing local prostitute Tanya (Evigan, daughter of My Two Dads’ Greg Evigan), and some of the guys die. This upsets crime boss Hollis (Dolph). So Hollis sends some more of his goons to kill Nguyen’s family. Now in full revenge mode, Nguyen vows to go after Hollis - but to get there, he must get info from Bennett (Jones) and figure out what the detectives investigating the case know. Will Nguyen get revenge? Will someone die of PUNCTURE WOUNDS? Man, this Cung Le guy looks like Cuba Gooding, Jr. I mean, he REALLY looks like him. Note how on the box art, his Cuba-face is strongly emphasized, while no actors’ names are present. Could this be a trick? Well, that aside, it’s a dark day in DTV-land once again, as these modern-day productions prove time and again they cannot hold a candle to their far-superior 80’s and 90’s counterparts. You know it’s a bad sign when two separate directors get two separate credits (and on the version on Netflix streaming at least, it’s shown under its alternate title, A Certain Justice). Here is no exception. The stupidity is all-encompassing, as everywhere you turn in this movie, something dumb is happening - with the possible exception of Dolph. 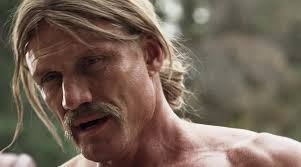 Whenever he’s onscreen, things are better, but he and his walrus ‘stache can’t save this turkey from its own sophomorically-written ways. It is indeed hard to believe someone over the age of 14 actually wrote this inanity down on pieces of paper. Hey, writers - instead of writing down to us, how about writing UP to us for a change? We’re action movie fans, not automatons that will just accept any old slop. From the unnecessary narration, to the gratuitous use of slow motion, to the puzzling stylistic choices such as quick cuts and foggy, blurred edges on screen, to printing the names of the characters on screen as if that matters/has never been done before, to the nu-metal-esque soundtrack, the whole thing seems targeted towards the ‘stupid market’. It all screams “NEW DTV production”, to its detriment. Yes, we’re glad Dolph is still working, and it’s nice to see mainstays like Vinnie Jones and Robert Lasardo (who is in one scene), so we don’t want to seem ungrateful, but Puncture Wounds is just not enjoyable to watch. We’re sorry, but there’s no getting around that, no matter how hard we try. The premise is even very similar to fellow Cung Le vehicle Dragon Eyes (2012) - Cung moves into an apartment complex in a bad neighborhood in L.A., beats up a bunch of people, and there are crackheads running around. But thankfully Dragon Eyes was directed by John Hyams, so it was better than Puncture Wounds. While we liked seeing Dolph as the baddie, and we thought that was a nice change of pace, it was really a wasted opportunity. So, yes, Puncture Wounds does have some action, but at what cost? The movie typifies some of the worst aspects of modern-day DTV, unfortunately. We thought it was a tough sit. I met Robert LaSardo at a film convention held at a hotel near the Angelika theater in Dallas, TX and he was a real sweet-hearted dude. Who else do you know at a convention who welcomes you with a bear hug and engaged in a laid back 3-hour discussion of politics, favorite comics/films/shows, script ideas and even social changes? Surprisingly, this film escaped discussion but we had plenty of other new releases to discuss. I even reminded him about a 1998 film he was in called CROSSFIRE and we then talked about how we couldn't believe it got next to no distribution on even the DTV market. His co-star of that film, Andrew Divoff (the one and only WISHMASTER) was also at that convention earlier but had left by the time I got there as it was Sunday the last day which was a shame but another time. This was pretty dire. Why is Dolph's career stuck in supporting roles? He needs to stop being expendable and return to being an army of one. Hell, he seems to be doing more overseas material. I also think he could easily be doing something far more mainstream as opposed to whatever Nu Image/Millennium Films has planned for him. Jeff: We enjoy these personal connections. Thanks for sharing your story. He seems like an personable guy. At the Chiller convention we didn't have an 3 hour conversation with Robert Z' Dar (RIP) but we saw him FACE-TO-FACE. Literally. Haha. Roger: That's very funny. Dead-on comment. That is stellar and I made sure to wish my pal Joe Estevez my condolences over the phone when I heard that his pal Bobby Z'Dar had passed so suddenly. I first became pals with Joe after I did my first Skype interview with him here and he enjoyed the interview so much that I recommended he work with my pal Harry J. Vaughn III and their upcoming series had a successful teaser trailer shoot. Blogger lost your 2nd comment. Very odd. To answer your 1st comment, we are big Z'Dar fans, and he always brightened up anything he was in. We agree he left us too soon, he has an amazing filmography. Strongly disagree with you here, I thought this was a pretty damn good film, I never felt like I was being "written down to" at any point.